This Site, including all its Content are protected under applicable intellectual property and other laws, including without limitation the laws of the United States and other countries. All Content and intellectual property rights therein are the property of Market Street – The Woodlands or the material is included with the permission of the rights owner and is protected pursuant to applicable copyright and trademark laws. Because we do not control the User-Generated Content posted on or through this Site, we cannot and do not warrant or guarantee the truthfulness, integrity, suitability, or quality of that User-Generated Content. You also agree and understand that by accessing this Site, you may encounter User-Generated Content that you may consider to be objectionable. We have no responsibility for any User-Generated Content, including without limitation any errors or omissions therein. We are not liable for any loss or damage of any kind you claim was incurred as a result of the use of any User-Generated Content posted, e-mailed, transmitted or otherwise made available on or through this Site. The User-Generated Content posted on or through this Site expresses the personal opinions of the individuals who posted it and does not necessarily reflect the views of Market Street – The Woodlands or any person or entity associated with Market Street – The Woodlands. Violation of copyrights. Market Street – The Woodlands does not knowingly violate or permit others to violate the copyrights of others. We will promptly remove or disable access to material that we know is infringing or if we become aware of circumstances from which infringing activity is apparent. The Market Street – The Woodlands names and logos, all product and service names, all custom graphics, all button icons, and all trademarks, service marks and logos appearing within this Site, unless otherwise noted, are trademarks (whether registered or not), service marks and/or trade dress of Market Street – The Woodlands (the “Market Street – The Woodlands Marks”). All other trademarks, product names, company names, logos, service marks and/or trade dress mentioned, displayed, cited or otherwise indicated within this Site are the property of their respective owners. You are not authorized to display or use the Market Street – The Woodlands Marks in any manner without our prior written permission. You are not authorized to display or use trademarks, product names, company names, logos, service marks and/or trade dress of other owners featured within this Site without the prior written permission of such owners. The use or misuse of the Market Street – The Woodlands Marks or other trademarks, product names, company names, logos, service marks and/or trade dress or any other materials contained herein, except as permitted herein, is expressly prohibited. In consideration of your use of this Site, you agree that to the extent you provide Personal Information to Market Street – The Woodlands it will be true, accurate, current, and complete and that you will update all Personal Information as necessary. WE MAKE NO REPRESENTATIONS OR WARRANTIES WITH RESPECT TO THIS SITE OR ITS CONTENT, OR ANY PRODUCT OR SERVICE AVAILABLE ON OR PROMOTED THROUGH THIS SITE. THIS SITE AND ALL OF ITS CONTENT (INCLUDING USER-GENERATED CONTENT) ARE PROVIDED ON AN “AS IS,” “AS AVAILABLE” BASIS, WITHOUT REPRESENTATIONS OR WARRANTIES OF ANY KIND. TO THE FULLEST EXTENT PERMITTED BY LAW, MARKET STREET – THE WOODLANDS, ITS AFFILIATES, AND THEIR SERVICE PROVIDERS AND LICENSORS DISCLAIM ANY AND ALL REPRESENTATIONS AND WARRANTIES, WHETHER EXPRESS, IMPLIED, ARISING BY STATUTE, CUSTOM, COURSE OF DEALING, COURSE OF PERFORMANCE OR IN ANY OTHER WAY, WITH RESPECT TO THIS SITE, ITS CONTENT, AND ANY PRODUCTS OR SERVICES AVAILABLE OR PROMOTED THROUGH THIS SITE. WITHOUT LIMITING THE GENERALITY OF THE FOREGOING, MARKET STREET – THE WOODLANDS, ITS AFFILIATES, AND THEIR SERVICE PROVIDERS AND LICENSORS DISCLAIM ALL REPRESENTATIONS AND WARRANTIES (A) OF TITLE, NON-INFRINGEMENT, MERCHANTABILITY AND FITNESS FOR A PARTICULAR PURPOSE; (B) RELATING TO THE SECURITY OF THIS SITE; (C) THAT THE CONTENT OF THIS SITE IS ACCURATE, COMPLETE OR CURRENT; OR (D) THAT THIS SITE WILL OPERATE SECURELY OR WITHOUT INTERRUPTION OR ERROR. MARKET STREET – THE WOODLANDS DOES NOT ENDORSE AND IS NOT RESPONSIBLE FOR STATEMENTS, ADVICE AND OPINIONS MADE BY ANYONE OTHER THAN AUTHORIZED MARKET STREET – THE WOODLANDS SPOKESPERSONS. 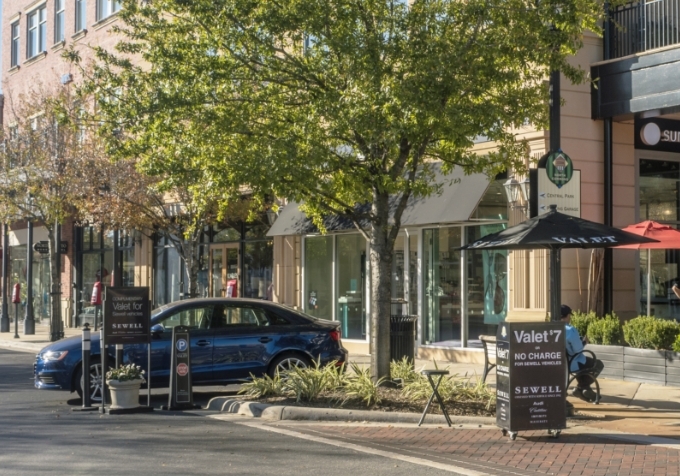 WE DO NOT ENDORSE AND ARE NOT RESPONSIBLE FOR ANY STATEMENTS, ADVICE OR OPINIONS CONTAINED IN USER-GENERATED CONTENT AND SUCH STATEMENTS, ADVICE AND OPINIONS DO NOT IN ANY WAY REFLECT THE STATEMENTS, ADVICE AND OPINIONS OF MARKET STREET – THE WOODLANDS. WE DO NOT MAKE ANY REPRESENTATIONS OR WARRANTIES AGAINST THE POSSIBILITY OF DELETION, MISDELIVERY OR FAILURE TO STORE COMMUNICATIONS, PERSONALIZED SETTINGS, OR OTHER DATA. YOU ACCEPT THAT OUR SHAREHOLDERS, OWNERS, OFFICERS, DIRECTORS, EMPLOYEES AND OTHER REPRESENTATIVES SHALL HAVE THE BENEFIT OF THIS CLAUSE. The term “Site” refers to the Web site located at https://shopatmarketstreet.com/ and owned by Market Street – The Woodlands. The terms “Trademark Property Company,” “Market Street – The Woodlands,” “we,” “us,” and “our” refer to Trademark Property Company. The term “User-Generated Content” refers to all of the text, photographs, images, illustrations, graphics, sound recordings, video, audio-video clips, and other Content that you post on or through this Site using the social networking tools we make available to you and that does not constitute Feedback. One way that User-Generated Content differs from other information you provide to us is that, once submitted, User-Generated Content is made available instantaneously to others who visit this Site. Examples of User-Generated Content include comments posted to discussion boards or beneath stories available on this Site. Looking for a specific shopping experience? Check out our full directory, with a current listing of all Market Street stores. If you have a specific question you’re unable find the answer to on our site, click below to reach out to us directly.